Caring for our community is a long&dash;standing tradition at Sakakawea Medical Center (SMC). Ever since our founding we have strived to care for all who need us and to bring health, healing and a better quality of life to our neighbors. SMC consists of a critical access hospital (licensed for 13 beds) and a 34&dash;bed licensed basic care facility. The medical center is a community&dash;owned, not&dash;for&dash;profit organization with a charitable purpose and is governed by a volunteer board of directors. Any money remaining after expenses have been paid is reinvested back into healthcare and stays in the community to purchase needed medical equipment and support health education and other community needs. SMC serves the communities, residents and visitors of Dunn, Mercer and Oliver Counties, and is located in the heart of rural Mercer County and housed in the City of Hazen. Sakakawea Medical Center dates back to 1941. The original hospital consisted of about a dozen or more beds on the second floor of one of the original main street buildings. 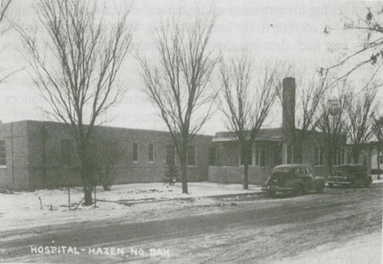 The hospital was a private undertaking by a Beulah woman who ran the facility for several years until Hazen's plans for a new, modern hospital facility were well underway. Community effort continued to keep the hospital open for a time. However, in the fall of 1946 the hospital closed due to difficulty in finding competent help. In 1945 an agreement was entered with Lutheran Hospital and Homes Society for operation of the proposed hospital. In the fall of 1946, construction got underway. After several years of planning and a long range feasibility study, the Board of Directors decided to proceed with the construction of a $1.2 million expansion and renovation of the hospital in February 1982. In 1988 the name of the hospital was changed to Sakakawea Medical Center (SMC) and is a community owned and operated hospital under the Hazen Memorial Hospital Association. Senior Suites at Sakakawea, a licensed Basic Care Facility, was added to the hospital campus in 1997. In 2012, Local Health Providers completed a comprehensive Community Health Needs Assessment (CHNA) which took into account input from more than 640 community members and health care professionals from the three counties, as well as 22 community leaders. Additional information was also collected through key informant interviews and a focus group involving locally identified community leaders. In addition, upon completion of the CHNA, Local Health Providers convened again to work on a strategic plan that would best serve the interests of all agencies involved and the community. Information obtained from the planning emphasized the need to address the physical environment in which we provide care to include space for additional services; need to expand and deliver efficient outpatient care; and the need to address the most efficient use of staff in a community where adequate staffing is an issue. In the fall of 2015, directly south of the current hospital, the Board of Directors broke ground to begin the construction of a replacement facility. The retiring facility was closed, and a new $30.5 million replacement facility opened in April 2017. The new medical center houses a health clinic attached within the hospital, an expanded emergency room and surgical area, handicapped&dash;accessible patient rooms, a centralized registration area and centralized nurse's station; and a myriad of other needed changes and technology updates. The new facility was designed to increase staff efficiency and accommodate changes underway in the delivery of healthcare as well as assisting healthcare providers to meet growing demands within the service area. Sakakawea Medical Center's Annual Tax Return (IRS Form 990) for the previous fiscal year is available for review by request at the Business Office located at 510 8th Ave NE; Hazen, North Dakota. You can contact the Chief Financial Officer at 7017482225 for information.